As the weather warms up Our Girls (hens) having been laying lots of eggs and we are struggling to keep up eating them all. Of course friends are welcome benefactors of these beautiful golden yolked free range eggs. Since I bake sweet treats every day in work I tend not to bake at home so I am having to be a bit creative with the eggs rather than just boiled, poached and scrambled. This Raw Pad Thai Salad inside the omelet is quick to make and adds a fragrance and texture to the dish. 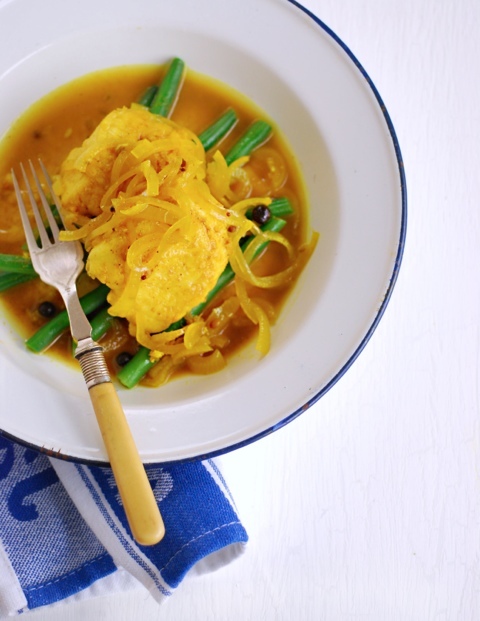 Tonight we are having another egg dish, Malaysian Egg Curry which I love and you can find a recipe here. 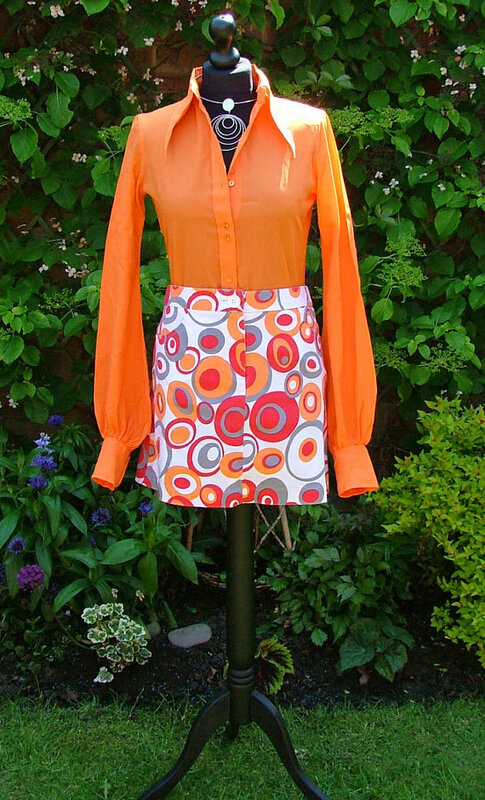 So I may not have had much time to write blog posts lately but I have managed to keep up with my shopping habits :o) Luckily for me all the best retro and vintage shopping is online so I can still fit that in when all the shops are shut and I have my feed up with a cuppa. Can’t wait for the summer to get here so I can sport this new outfit of mine. This is really just an rough idea per omelet, you can vary the type of veg you like. The ingredients are per omelet below so increase per person. Pinch of chili powder or fresh chopped. I’m not going to tell you how to make an omelet, I’ll let you make it your favourite way. Place the shredded cabbage, carrots and ginger in a bowl. Mix all the dressing ingredients together and add to the veg mix and toss through. 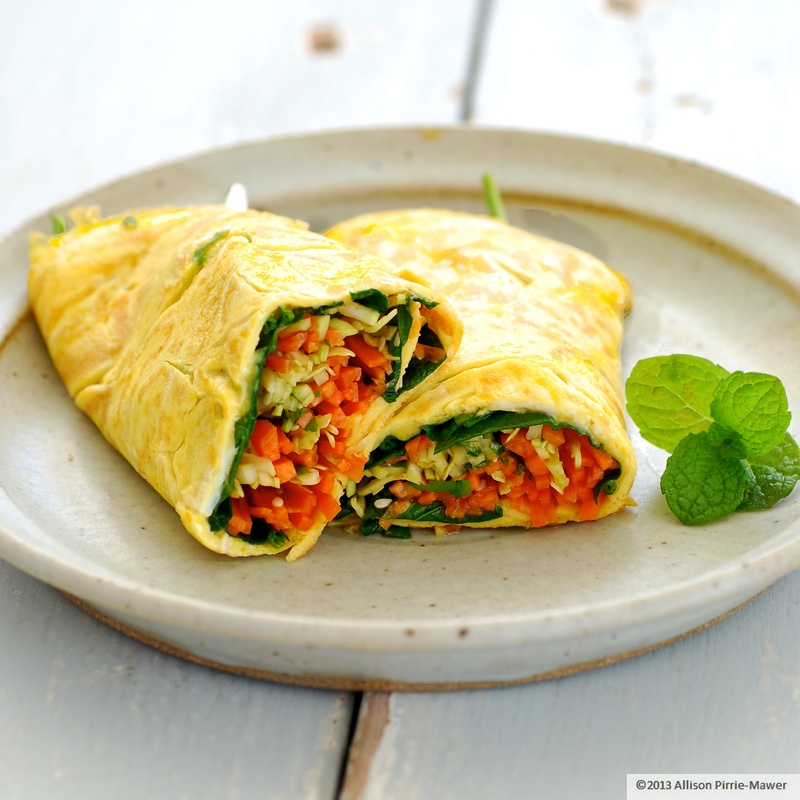 Place the cooked omelet on a plate and fill one side with the Raw Pad Thai Salad. Fold the other half of omelet over and enjoy. This would also make a nice ‘packed’ lunch the next day, just keep your salad separate from the omelet and assembly when you are ready to eat it. Cook the couscous as per packet instructions then rinse and cool. Skin & de-seed the pumpkin and dice into one inch squares. Place pumpkin in a roasting pan/tray. Mix together the cinnamon, cumin, turmeric & olive oil and pour over the pumpkin. Rub the oil and spice mix through the pumpkin so it is coated. Roast the pumpkin for 15 minutes or until tender but still has a bite to it. Allow pumpkin to cool before mixing it with other ingredients. 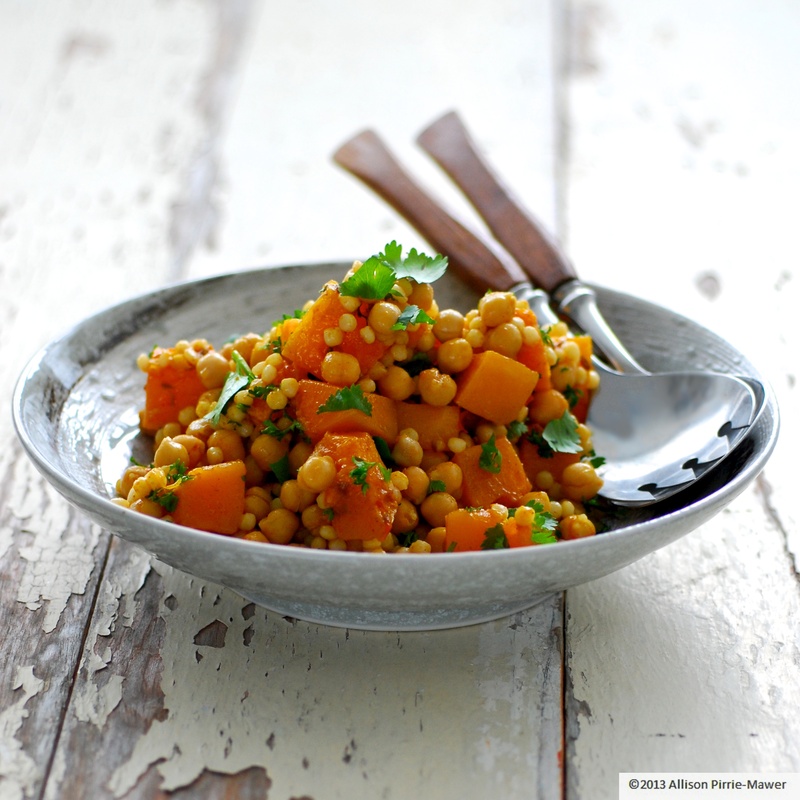 In a large bowl combine the chickpeas, roasted pumpkin and cooked couscous. Add the harissa , lemon juice & zest, coriander, parsley. Season to taste with salt & pepper. Goes well with roasted chicken, lamb chops or grilled fish or just served on it’s own. I posted in September that I had written a few recipes for Nourish magazine and promised to post all of the recipes on my blog once the issue had been released, well here they are finally. It’s been a busy week of work, cooking classes organising a Blogger dinner event and bathroom renovations, any spare time has been spent with a hammer or paint brush in my hand. I have to confess, I have many recipes and photos sitting on my Mac that never make it onto the blog, I always have time to cook and eat and love to photograph but finding the time to sit down and write them up is a little harder to find. It certainly comes in handy though for weeks like this. 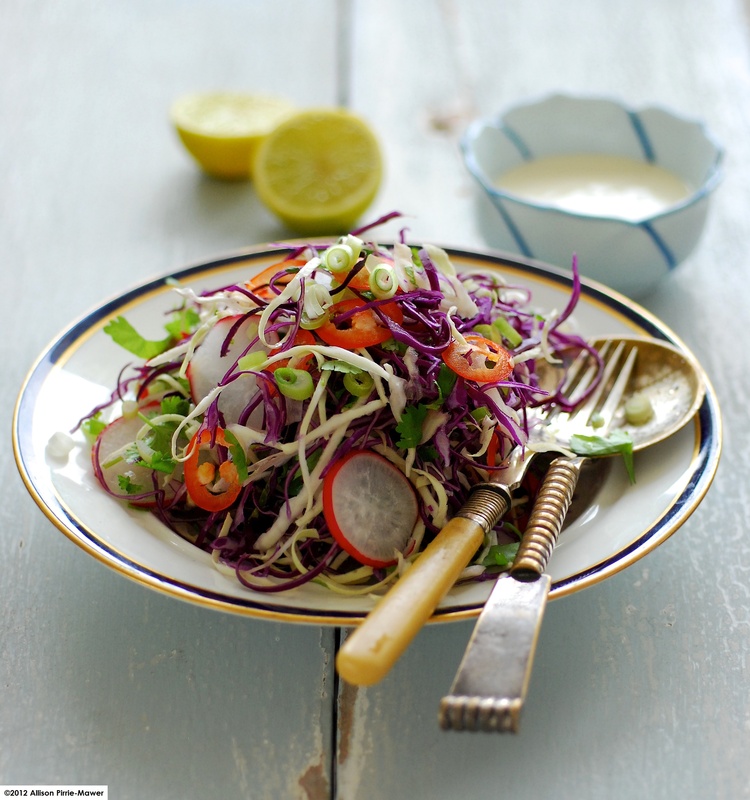 Mexican seems to be all the craze at the moment and this Slaw the perfect way to spice up your summer burgers, whether fish, chicken or beef. If the weather is not quite warm enough at your ‘neck of the woods’ to get into leafy salads, try the warm cauliflower salad or the bean & pea salad. Slice the cabbage and radish as thin as possible, almost paper thin! I use a mandolin. Place in a large bowl. Finely slice the spring onions and chili, remove chili seeds if they are too hot (they are the hottest part of the chili). Add to the bowl with the cabbage and radish. Add the chopped coriander to the bowl. In a separate bowl place the sour cream, lime juice, zest and salt, mix together. Add the sour cream dressing to the coleslaw just before serving so it doesn’t go too soft. Defrost both the garden peas and broad beans. Remove the outer shell of the broad beans (they can be chewy). 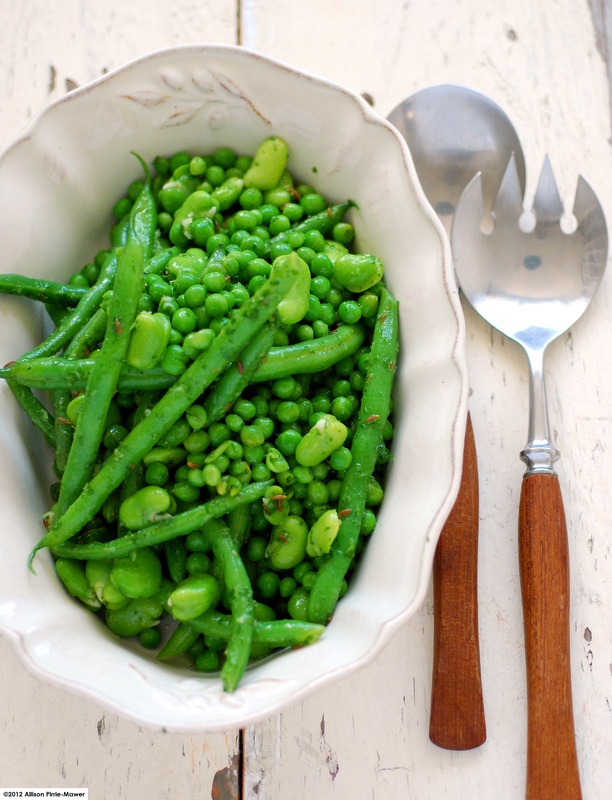 Thoroughly drain the peas and podded broad beans then place them in a large bowl. In a large pan of boiling water blanch the green beans for 2 minutes then drain and plunge into a bowl of ice cold water, this will stop further cooking and keep them bright green. Drain the green beans and add to the rest of the beans & peas. 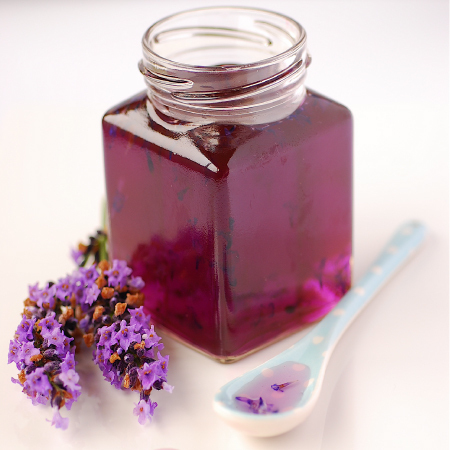 Blend together the olive oil, lemon juice, cumin seeds, coriander, parsley and garlic to a smooth salad dressing. Mix the dressing through the beans and serve. Optional: you could serve with some crumbled feta cheese. Steam cauliflower for 2-3 minutes, you want it still to have a little crunchiness to it. Place all the other ingredients into a blender and whiz together to make the dressing and season to taste with black pepper & salt. 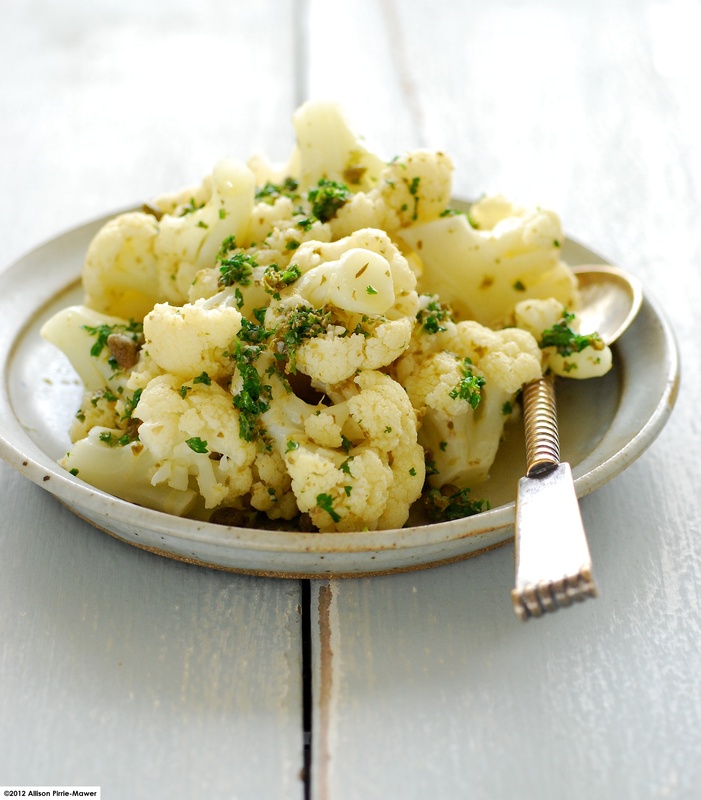 Place the cooked cauliflower onto a serving platter and drizzle with dressing. A few weeks ago I was busy creating, styling and photographing salad recipes for Vicki’s Spring Nourish Magazine, which has just gone to print. If you are fortunate to live in the Waikato or Bay of Plenty areas you will be familiar with their beautiful, almost organic feeling magazine with its quality mat paper that feels so right for promoting seasonal produce, farmers markets and vibrant food recipes. You can’t help but brush your hand across the pages when leafing through it, almost feels like the vegetables will spring out in your hand. It was an interesting exercise preparing dishes for an edition a couple of months in advance when all the produce is not yet available, I really wanted to use asparagus…oh how I crave asparagus season which is still a few weeks away. instead I opted for beans, cauliflower and root vegetables which will carry us through from now until October. As well as this salad I made a Mexican Style Coleslaw which will be perfect for those burger and BBQ days, a Vibrant Three Bean salad and Cauliflower, Anchovy & Caper Salad for the magazine. Drain the tinned lentils, then place in a large bowl. 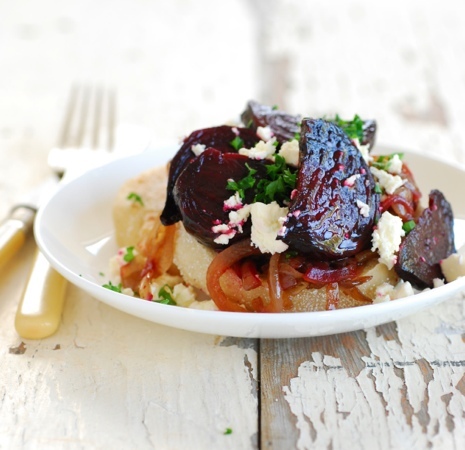 Place the beetroot and carrots on a roasting tray and coat with 2 tablespoons of olive oil. keep the beetroot and carrot separate if you don’t want the beetroot to turn the carrots pink. Roast for 20 minutes, they’ll still be a little crunchy, then add to the bowl of lentils. Blend together the sundried tomatoes, parsley, coriander, zahtar, balsamic and olive oil to a thick dressing. 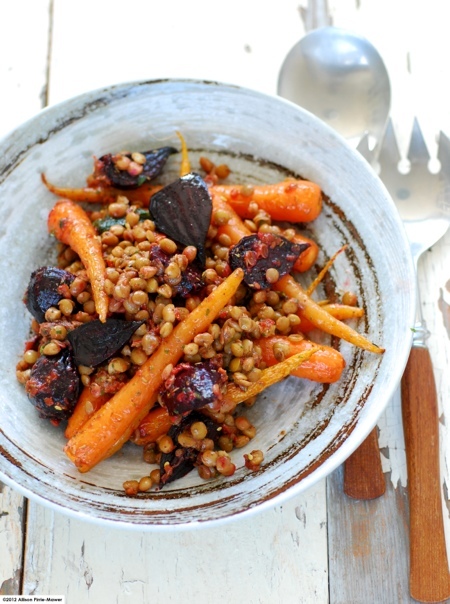 Add the dressing to the bowl with the lentils & roasted vegetables and mix through. Season with salt & pepper to taste and serve warm or chill in the fridge to serve later cold. After a busy work week a leisurely weekend breakfast is a welcome treat, whether at home or out at cafes with friends. I conjure these breakfasts up in my mind through the week, oddly after doing exercise the mind instantly roams towards food….hmmm what would I like to eat, what should I really eat, what is there to eat when I get home? The ‘like’ usually wins every time, in this case it was a rather healthy breakfast over the belly pork & pickle sandwich I had the day before. I have taken up Bikram yoga and those who know me will smile and say “that’s nice Al”, knowing what that means, a new sport or exercise I have picked up which I will flog to death until my attention is diverted somewhere else. When I find something new I fall in love with it, become a little fanatical about it, believe everyone else should love it, convincing them they should join me in my new pursuit. Sometimes they do, often to find I have already moved onto my next fad. In this case, Bikram yoga, I thought might actually flog me to death. A hot room in mid winter sounded appealing, a tropical oasis to warm the body was more appealing than going to the pool or a for a jog in temperatures of 5 Celsius. I thought I was pretty fit until I nearly passed out 20 minutes into the class. 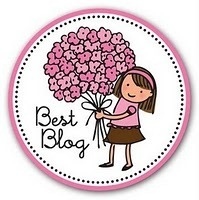 The veterans in the class smiled, nodded knowingly, “it will get better the more you practise they said, your doing great”. I was feeling nauseous at this stage and felt like poking their eyes out, why would I even try again if it was this bad? Stubborn by nature saw me back there two days later, no way a hot room was going to beat me and thankfully I didn’t faint the second time but the jury is still out, this fad may have the shortest life span yet. Enough of excise, here’s the recipe. Although I did make my own muffins you can easily buy them or use your favourite bread instead. I would suggest if making your own muffins, make the dough the night before and leave in the fridge overnight to rise, saving time in the morning. You don’t want breakfast to turn into lunch! Cut the peeled beetroot into wedges, approx 8 per beetroot. Place the beetroot in a roasting tin with a tablespoon of olive oil and some rock salt to season, toss together to coat the beetroot. Roast in the oven for 40 minutes. Prepare the onions while beetroot is roasting. In a frying pan over a medium heat add a tablespoon of olive oil and the sliced onions. Sauté for 15 minutes until onions are opaque and soft. Add the balsamic vinegar and cook for a further 5 minutes. Here’s the English muffin recipe, they really are easy and fun to watch turning into shape in the frying pan! Warm the milk and water to a luke warm temperature. Add the sugar, stirring until dissolved. Sprinkle the yeast on top of the milk and water and stand until it begins to bubble. In a large bowl, add the milk & yeast mixture and 1 cup of flour. Beat until smooth. Add salt and rest of flour, or enough to make a soft dough. Knead for 5 minutes and divide into 8 and roll into smooth balls. Sprinkle waxed paper with cornmeal and place the dough balls on this to rise. Dust tops of muffins with cornmeal also. Cover with a plastic bag or wrap and let rise till doubled in size. Heat a cast iron frying pan over a low heat and cook. muffins for about 6-8 minutes on each side. They will double again in size in the pan and should be golden brown on the first side before you flip it to cook the second side. We like our pickles in Britain, whether on a cocktail stick with cheese, jazzing up a butty (sandwich), part of a ploughman’s salad or accompanying a roast but this was a new dish introduced to me by a South African friend, Cape Malay Pickled Fish. Having eaten plenty Ceviche and Ika Mata and being a pickled ‘anything’ fan I had no doubt that I would like this dish as we discussed the ingredients but I wasn’t expecting the fish to be cooked before it was marinated! So if you are introducing anyone to marinaded pickled fish this is probably a good place to start if they are squeamish about trying ‘raw’ fish. The curry spices give it an interesting twist and it has the makings of a traditional pickle so for those pickled vegetable fans out there this is one its to try. Cut the fish into 2 inch size pieces. Put a few tablespoons of vegetable oil into a large heavy based frying pan over a medium heat. Fry fish on both side until cook through, you don’t use any flour as this will make go gluggy in the marinade. Once cooked lay the fish into a glass casserole dish and put aside. Add all the other ingredients Into a small pan over a medium heat and bring to a simmer. Cooking for 6 minutes until the onions are cooked but still firm. Pour the hot marinade over the fish and place in the fridge. Marinade for several hours or if you have the time overnight so all the flavours infuse better. If you had read the previous post you will know that I have been making cheese over the Christmas break and you can find a recipe for Feta Cheese here. As well as a simple Greek Salad I turned my feta into this lovely bean, herb salad which was the perfect accompaniment for a summer BBQ, albeit our summer at the moment is quite questionable. 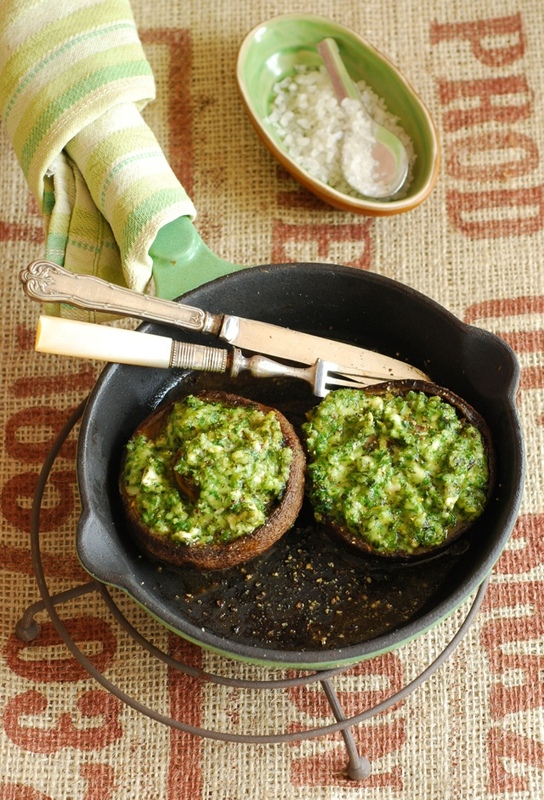 We also enjoyed stuffed field mushrooms with pesto and feta for breakfast one Sunday morning and definitely a dish I could eat for breakfast, lunch or dinner. I am also very excited about my Camembert which is maturing nicely and look forward to introducing you to that soon. What shall I make with it or should I eat it au natural? It was made with un-pasturised milk so I am convinced it will be special, very European I hope as the Kiwis do not yet make un-pasturised cheese even though it is now permitted to produce here. 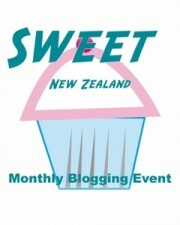 Correct me if I am wrong and you have found an New Zealand un-pasturised cheese, I will gladly hunt it down. Blanch the broad beans as per instructions on packet and then drain and plunge in ice water. Drain completely. Rinse the garden peas in cold water only, they don’t require cooking. Add all the ingredients to a large bowl and combine. Goes well with fish, chicken or just on its own. I have given the approximate ingredients per portion for a guideline on purchasing but it’s really a recipe where a bit more or less of one thing will not matter, it’s all about preference and tasting as you go. Combine the pesto and feta together in a bowl. Place the mushrooms on a baking tray, I used my individual oven proof frying pans. Spoon pesto/feta mix over the mushrooms. 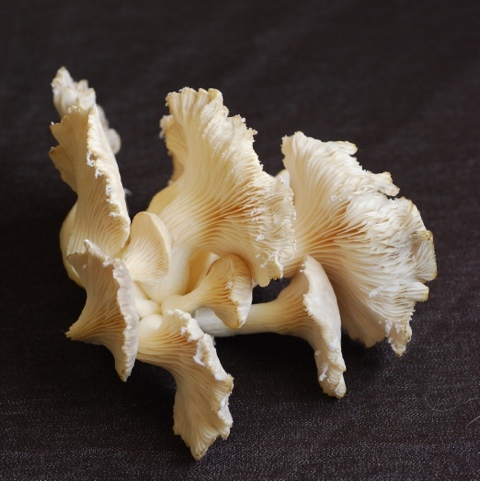 Place mushrooms on serving plates and garnish with cracked pepper. One rainy day over the Christmas break a few girlfriends and I decided to make some cheeses, feta, Camembert and Mozzarella. We buy milk from a local farmer by the 10 liter bucket so it makes sense to make cheese in bulk. The mozzarella I have made many times before and there is a recipe here, the Camembert I will blog about once it has matured over the next few weeks. The good thing about the feta is that it is ready to eat straight away or you can hold it in a brine solution for a few weeks. It produces a nice soft creamy feta, not crumbly like traditional but perhaps that is because it was so fresh and it didn’t get a chance to age it. I’m also running a feta cheese making workshop at Gourmet Gannet in March for anyone interested and also take private group booking in Auckland. I have not included a recipe for Greek salad, it is how you see it, either sliced or chopped tomatoes, cucumber, onion, feta cheese, a drizzle of olive oil, add some olives if you wish. I have a few more recipes with feta coming next, in the meantime here is how to make feta if you would like to give it a go, it’s quite easy. Sterilize all equipment you are going to use. You can use the sterilizing tabs used for sterilizing babies bottles, found at local supper markets. Follow manufacturers instructions. Add the Flora Danica Culture or Lipase. Dilute the rennet with a tablespoon of water. Add the rennet to the milk and stir well. Leave for 20-30 minutes to allow curds to form. Cut curds into 1 cm cubes with a knife, then cut curds across the centre. Leave the curds to sit for half and hour, folding them over each other every couple of minutes. Ladle the curds into the feta moulds and allow to drain overnight in the fridge. Placing the moulds on a wire rack so the whey drains through. In the morning make a brine solution of 20% salt to water. Place the feta in the brine solution. 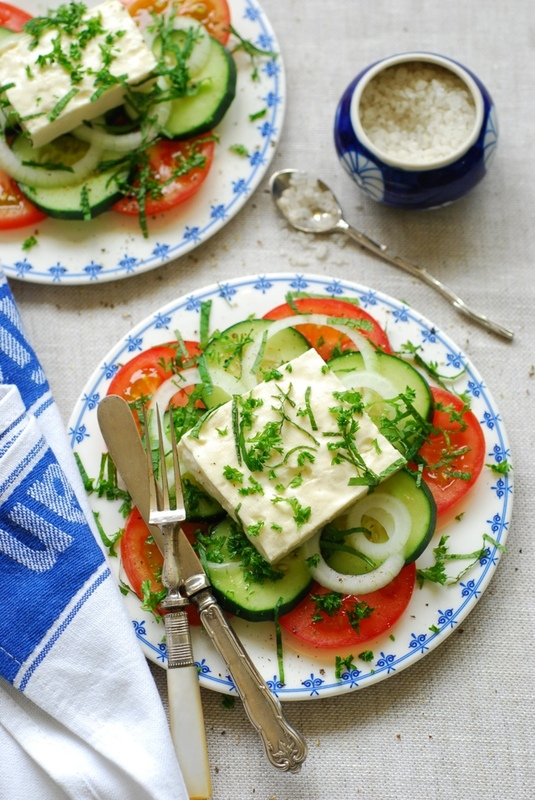 Feta can be eaten after 12 hours soaking or left to mature for up to two three weeks. The other week we stopped by Zus & Zo Cafe on Jervois Rd for brunch and I didn’t get far down their menu when I spotted this open sandwich and that was my choice taken care of. They serve this as ‘single’ or ‘double’ sandwich which I thought was rather cool since I prefer less bread and more filling so the one slice was perfect for me. 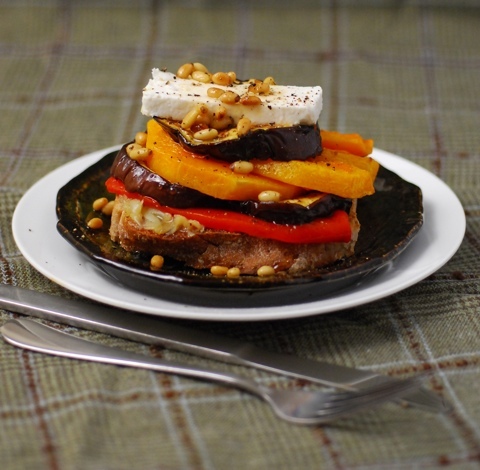 Warm roasted vegetables served on toasted wholegrain (you can actually choose what bread you prefer) drizzled with honey and topped with goats cheese and pine nuts…delicious. As I was recreating it at home I imagined it would be the perfect light lunch to share with Natalie over at Food Blog and the Dog in her garden in Andalucia, Spain. Although Natalie’s blog is fairly new to me I feel like I know her quite well through her recipes and writings about her surroundings. She always offers wonderful pictures of produce growing locally that she passes on her walks with Rufus, their dog. Bon appetit! There are no particular quantities, you just need to have enough of each veg to cover however many sandwiches you are making. Slice the pumpkin and aubergine and lightly brush both sides with olive oil. Place on baking tray with the whole bulb of garlic and roast for 15-20 minutes or until cooked and golden. Toast your pine nuts for 5 minutes, keep an eye on them so they don’t burn. Toast your bread slices and melt your honey if not the liquid variety. Peel the roasted garlic and mash onto the toast. Layer the vegetables any way you wish, top with a slice of goats cheese. Drizzle with honey and sprinkle with pine nuts. This is my take on Jamie’s dish Gooey Burrata with Smashed Herb Peas which we had as part of his degustation menu at Jamie’s Fifteen in Cornwall last month. It’s one of the dishes that stood out most even though it was rather simple in concept but that’s what I love about Jamie’s cooking. We do not have Buratta cheese here in NZ so I went for the softest mozzarella I could find which was almost as good. 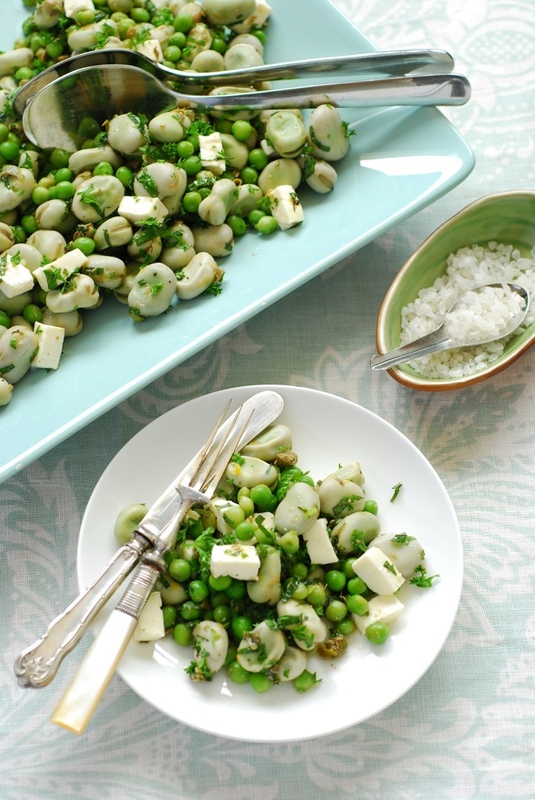 It’s quite an easy dish to put together and you can get all the elements ready in advance then just reheat the peas and mozzarella through just before you are ready to serve. It looks rather impressive and creative no one will guess how easy it was, although I’m sure Jamie’s was a little more complex than this. 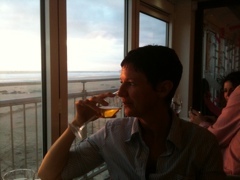 The pic below the recipe is of me sitting in Fifteen overlooking Watergate Bay. Oil the base of a pan large enough to fit all the mozzarella cheese without each piece touching. Put the milk and mozzarella in the pan over a very low heat just to warm the milk. Do not let it boil as this will cook and melt the mozzarella too much, you just want it to soften slightly. Pour boiling water into a pan with the peas, bring to the boil then drain the peas. Mix some balsamic glaze to the salad leaves. 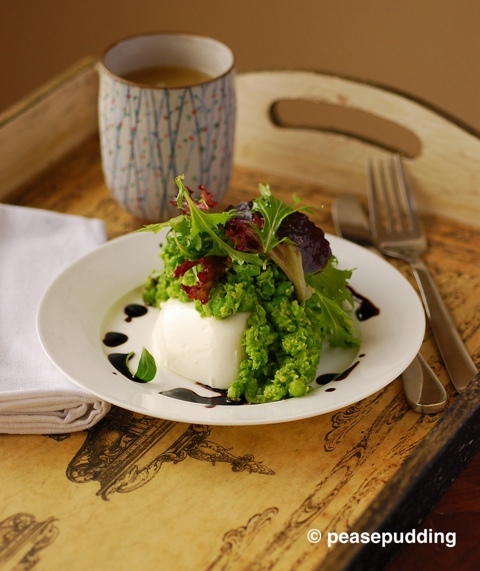 To assemble first scoop the warm mozzarella out onto a plate, pile on the peas and then the salad and finish off with an extra bit of balsamic glaze around the plate. 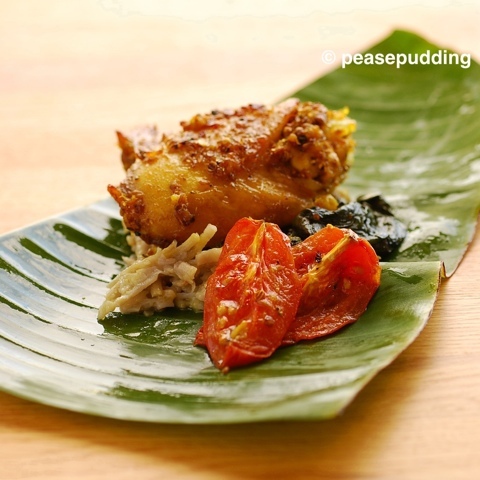 You can add a piece of pan fried fish too if you want to make it a more substantial meal.